Easily adjust the size and configuration of your wine collection with this stackable wine glass rack! Holds 8 to 16 stems. Stack racks high and save on space! One level, two levels, three.... Easily adjust the size and configuration of your wine collection with this stackable wine glass rack! Holds 8 to 16 stems. Designed to fit securely one on top of the other for space-saving storage. Stand alone or stack with the 12-Bottle Cube Rack and 12-Bottle X Cube Rack. Strong, weighty hardwood allows you to stack from floor to ceiling safely. Perfect on a countertop. Easy to assemble. No hardware required to stack, but should be secured to the wall if 3 or more are stacked high. Walnut stained Mahogany wood. Will this hold riedel performance cab glasses? BEST ANSWER: This unit is 15.5 inches in height, so any glasses should fit. Yea. It is versatile for all wine glasses with stems. BEST ANSWER: The cube stack has a stock dimension but multiple units can be purchased for a larger, more creative look. Yea, buy multiple as I bought 4. This rack is 15-1/2"H x 18-7/8"W x 10-9/16"D.
What is the largest height of wine glass that will fit? how many of the Riedel vinum XL cab glasses will this hold? 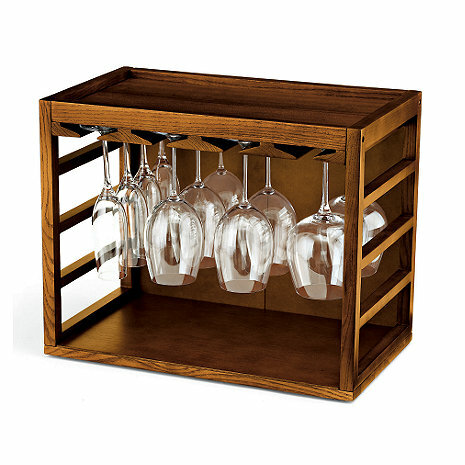 BEST ANSWER: The Cube-Stack Wine Bottle & Stemware Rack Set (Walnut Stain) will easily fit 12 of the Riedel vinum XL glasses. Is there a wine rack product that stacks with this? Will Reidel Veritas glasses (item 799 09 02) fit in this rack? BEST ANSWER: Yes these glasses will fit. How big a base does this rack accommodate? I have a set with a 3 5/8" base. Will they fit? Can this product be fastened to a wall, suspended off the counter. In the picture it looks like it's just sitting on a counter. I would like to elevate off the counter, by securing to the wall. Is this doable? without drilling ugly holes in all the wrong places. Thank you. BEST ANSWER: You could fasten to wall but would probably need to secure with screws or maybe just use shelf brackets. BEST ANSWER: Thank you for your question. Unfortunately the Triump glasses are too large. The Classic line would be perfect though! Any further questions, feel free to give us a call at 800 377 3330. Thank you again. the riedel performance cab glass has a 4 inch base, will this fit in the rack? I just received four of the cube wine glass racks. Each box contains a strange piece of metal hardware not described or listed in the instructions. It looks like it could be brass or brass like metal, rectangular shaped but with a bump in the middle. What is it for? The stems for my favorite wine glasses were too tall to fit into the cabinet. This works perfectly to store them safely and attractively on the kitchen counter top. Does what it was intended to do . . . . Putting this unit together is fairly easy as long as you own a drill and/or an electric screwdriver. If you do not then I would not suggest purchasing this item. The holes for the screws are not pre-drilled; there are just "dimples" in the wood where they expect you to line up the pieces. Using a manual screwdriver to put this together would make for an extremely frustrating task. This is not fine furniture by any stretch of the imagination so please do not expect it to be anything other than an inexpensive, space saving storage solution. It took me roughly fifteen minutes to put this together (once I figured out the dimple thing.) I am happy with my purchase as it fits perfectly in the small alcove that I have and it holds quite a lot. Service was excellent, delivery very prompt on the items not back-ordered. I had problems with a catalog code and received excellent customer service retroactively applying the package price, and working with shipping costs as well. The customer service makes up for the moderate quality of the items. I purchased this item for storage of extra wine glasses we use at parties. The unit was extremely difficult to put together but looks very nice. It's a sturdy unit. Only 2 red wine glasses fit due to the size. The finished product is quite attractive and a good size even on its own as a counter topper. I wasn't very impressed with the assembly process. Several spots needed drilling out and I even had to run one of the backing boards through my table saw to square an edge up. There are several rough spots that snag when I try to polish it as well. Thankfully, in the end, its a sturdy, attractive piece. For the price paid however, I feel that it shouldn't need extra work. First, the good part: It is wood and doesn't look too bad when assembled. Now the bad part: The wooden parts are poorly fitting due to pre-drilled holes that do not align. I had to try to re-drill the pieces to get "close enough". The result is a slightly out of square cube. For the extra work involved, it is an over priced, poorly made item that you will be better off not purchasing. Pieces didn't fit well together so I sent them all back and received a refund for my purchase price but was not reimbursed for the $64 I had to pay to return them. Use with wine storage crates. Holds 2 of the larger wine glasses in a line, 8 all together. Additional holes had to be drilled for the backing to be assembled. We added this to the top of the wine racks. Looks nice and frees up cabinet space. Did fasten it to the wall so that we don't have to worry about it tipping over. Very difficult to assemble. Shoddy quality - pieces didn't line up, etc. Overall looks cheap. I needed wine glass storage for a countertop in an efficiency apartment that we use as a second residence. The glasses are held securely in an attractive frame and I have space to store other related items on the top. I love it. Love this. Bought two to use in our wine cellar. I had my son assemble but it only took an electric screwdriver. love having the glasses all in one place and they look good, too. Purchased two units to stack on our granite countertop above our wine refrigerator. It looks as though it is nice furniture built specifically for that area. I use this in my wine bar as a small rack for my best glassware and it does thetruck for little piece like this. We bought 4 cubes in different styles and the only negative comment is that one of the 4 cubes stain was much lighter than the 3 companion cubes. Otherwise, it is a great, efficient and cost effective storage solution for a small space. No, delivery is not prompt; we had to wait for the first one and we are still waiting for the second, which should have arrived by now, but we are being told it will not arrive for several more weeks, very disappointing. Yes, arrived in good condition. Nice looking product but it requires some drilling of the holes because the pre-drilled holes are not deep enough to keep the wood from splitting. I like the look of the unit. The issue was that the holes for the screws had to be drilled out or the wood would crack. I had to have one of the cubes replaced because the wood split when I put the screws into the wood pieces. I called Wine Enthusiast and they sent me a replacement cube which I promptly drilled out the holes and it went together fine. Building this was difficult. Many Parts did not line up properly and the design to place the back panel onto the rack is impossible with the use of screws. We had to buy tacks separately in order to get the back panel attached. Once we finally got it assembled it looks nice, but for the cost this took way to long to build and was poorly designed for assembly.